We arrived at Palmer Station late last night. Phoebe arrived here about an hour ago. Holy Idaho! Can I just say that considering Phoebe is such a wealthy lady - she certainly doesn't have a "wealth" of knowledge! I will tell you the entire story. You see, Palmer Station has several small research buildings. There is also a helicopter pad (where our helicopter landed). Phoebe arrived by boat at one of several places to dock. Geo, Uncle GT, and I walked to the various research centers looking for Phoebe. We carried a picture of Phoebe and Dewey along with us. The people in Building 1 said they hadn't seen her or the dog. Building 2 had a researcher who started laughing out loud when he saw the pictures. He said, "Oh you are looking for the wacko polar bear lady." We were all sort of confused. The researcher explained, "I think I saw the lady you are looking for -and the dog. She came in here asking me questions about the polar bears in Antarctica. Obviously, she hadn't done her research, because there ARE no polar bears in Antarctica. They are on the other pole. I told her if she wanted to see polar bears, she had a LONG flight to the northern tip of the northern hemisphere. We are WAY south in the southern hemisphere. If you want to see some animals here, you better be looking for Penguins. 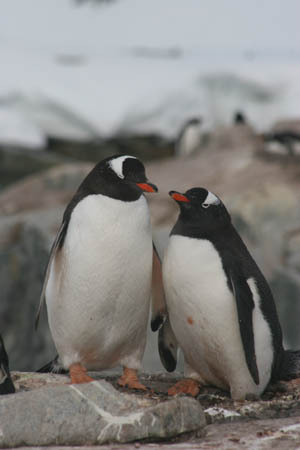 And most of those aren't even around right now - except the Emperor Penguins." Holy Idaho! We couldn't believe Phoebe was crazy enough (or so misinformed) to think that she would see polar bears. Hehehe! The researcher told us that Phoebe was heading to Building 4 (because she was obviously embarrassed about the "polar bear incident"). Phoebe wanted to talk to the other researchers about ice levels. Why do you think Phoebe wanted to talk about the ice levels? This is one wacko woman! The researcher also told us that Phoebe didn't understand why it was dark most of the time at Palmer Station in mid-April. Seriously, this lady is clueless. Palmer Station is located in the southern hemisphere (remember the area south of the equator), just above the Antarctic Circle. So that means that April is near the start of WINTER. During the winter months there are only one or two hours of sunlight near the Antarctic Circle, in Antarctica, and there is no sunlight at all further south. Do you remember any other places we visited that had limited daylight? I remember two places - do you? The research center had pictures of several types of penguins. We included some in our blog. Aren't the penguins adorable? 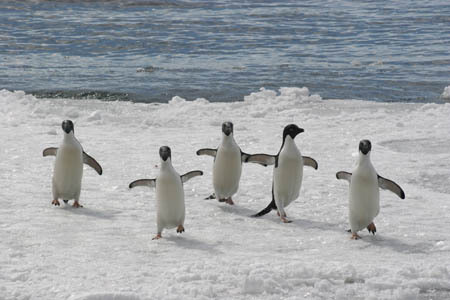 These penguins are "dancing" Adelie penguins. They love to have fun and are about 18-20 inches. Photo used by permission. © Copyright 2007 W. Pomeroy. All rights reserved. 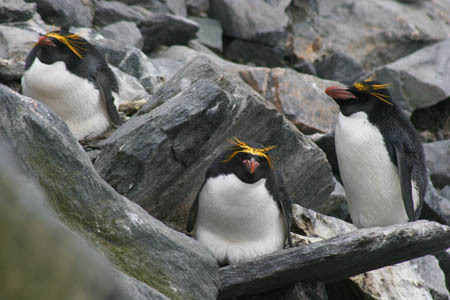 These are the Macaroni penguins, named by the British. The British called feathers, macaroni. Do you know a song that involves a feather/macaroni in a cap? Photo used by permission. © Copyright 2007 W. Pomeroy. All rights reserved. More adorable penguins! Photo used by permission. © Copyright 2007 W. Pomeroy. All rights reserved. The Capture of Phoebe Equator! As Meri mentioned, we knew the exact building where Phoebe (and Dewey) were. Uncle GT and the government officials were talking with the researcher still, but Meri and I couldn't wait any longer. We went over to Building 4 where Dewey and Phoebe were. We walked in the building and showed the researcher the picture of Dewey and Phoebe. He said they were in the gift shop grabbing a snack. This was it! We walked into the gift shop and came FACE -TO- FACE with Phoebe and Dewey. Her eyes opened very wide and her mouth opened but let out nothing but little noises for a few moments. Then she muttered something to another lady in the gift shop about how we had been running into each other all over the globe. It was crazy! We told her that we were here to rescue Dewey; the charade was over. About two seconds later, Uncle GT and the U.S. officials walked in, too. They stood near the door while we talked to Phoebe. Meri told her that the U.S. Government had sent officials to Palmer Station to arrest her for stealing government property. Phoebe's eyes darted around, then down to the floor as she started denying knowing anything about Dewey being a stolen dog from the U.S. government. Dewey lowered his back into a crouch and started to back away from Phoebe, whining almost into a howl as if something was hurting his ears. Remember - he sniffs out the truth! He was slowly wiggling his neck trying to get loose from the collar and chain holding him to Phoebe. Phoebe shifted her weight and scolded, "Sit, Dewey." She explained that she purchased Dewey from a company in China. She claimed that she had actually just saved Dewey from a wild polar bear! She is unbelievable! Meri calmly stated, "No, you didn't buy Dewey - you STOLE Dewey for the second time. We know the entire story: you blamed your husband, Claude, for the initial dog-napping, sold Dewey to Veritas, stole him back from Veritas, and all of the rest of the pranks you've pulled. And a polar bear - seriously! You certainly have not done your research! There aren't ANY polar bears in Antarctica! You are at the wrong pole to see polar bears. " Phoebe shook her head and insisted, looking up at Uncle GT, "They Lie." Again, Dewey pulled and backed away from Phoebe with a low growl. I decided to try to speak to Dewey in German, the language Veritas said he was trained in. (Remember we learned some simple German from Fraulein Garrett in Germany). I said to Dewey in German, "Hallo- freund" (translates to hello - friend). Dewey's head snapped around as he looked straight at me, and his tail started wagging happily. He wiggled the rest of his way out of his collar and ran to Meri and me. He licked Meri's hand and snuggled up against my leg. Meri hugged him and told him that he was safe now. In the meantime, the government officials came in and handcuffed Phoebe. Phoebe asked if she could say a few final words to us. The officials ushered her over to us with her hands behind her back. Phoebe apologized to us and to Dewey. She jabbered on that she was just a selfish woman. She loved her diamonds, caviar, fashionable clothing, and expensive cars. She just wanted to learn the truth about the Northwest Passage, she said, because she figured she could make a LOT of money. She was using Dewey to learn the truth about global warming, polar ice, and the opening the Northwest Passage. She wanted to buy land there, build more hotels, and get rich from it. She never meant any harm to come to Dewey, she said, and she treated him very well. Dewey's tail thumped on the floor, so we knew she was finally telling the truth. Even though Phoebe was sorry for what she had done, she had still stolen United States property and was under arrest. 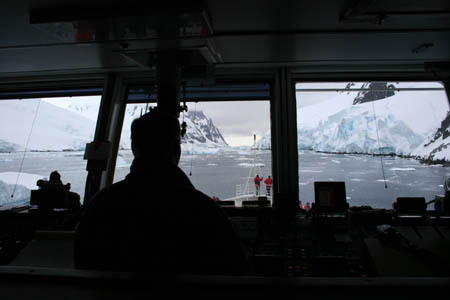 Since Palmer Station is a United Stated research center, the United States officials had the authority to arrest her there and take her back to the states for a trial. Here is the view from the window inside Building 4. Photo used by permission. ? Copyright 2007 W. Pomeroy. All rights reserved. We flew on the United States jet from Palmer Station to Sydney, Australia, with Phoebe in handcuffs, Uncle GT, Dewey, and the other government officials. When we arrived in Sydney, we had more than ten text messages from Pandora. I guess we hadn't had any reception on our cell phone for a while. She was pretty angry (and worried). So we gave her a quick call. She was so happy that she actually cried!! She said she was so worried about us she hadn't been able to sleep for several days. Boy, was she grumpy. So now we are in Sydney, Australia. Our flight home leaves in just two hours. Holy Idaho! I can't believe our mission is complete. Uncle GT, Dewey, and the government guys are flying to their headquarters in Washington, D.C.; they are taking Phoebe, too (to jail). Geo and I are on our way home, connecting through Los, Angeles, California. We have not been in the states since November! I wonder what Pandora will do when we get home? What do you all think? What do you think our annoying little sister Pandora will do when we get home? - Demand to see our cell phone and read all of the text messages? - Look at our pictures from all of the continents that we have visited? - Ask us a million questions all at once?